A pair of Hyundai dealerships in London will be named as specialist retailers of the Korean brand’s hydrogen fuelled vehicles within the next six months. Until now, hydrogen-powered versions of its ix35 SUV have only been available direct from the manufacturer’s UK base at High Wycombe but Robin Hayles, the brand’s sustainable fuels development manager, has revealed that things are about to change. Speaking at an event which saw a team of drivers lap the M25 to set record for the longest continuous drive in a hydrogen powered car Hayles revealed: “We have no dealers set up for hydrogen sales at the moment. Ask me that same question in six months and we will have two dealerships set up for sales and finance and capable of discussing the tax benefits with people. “Until this moment in time everything has come from our central office in High Wycombe. “It has been quite an intensive hand-holding process in terms of educating the customer and it has just been easier for us to do it that way. 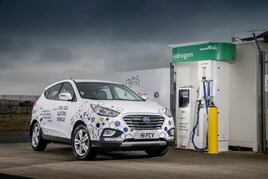 Hyundai currently has 15 hydrogen-powered cars on UK roads, along with around six Toyota Mirais and many more Ford Transit’s which have been converted to work on hydrogen by Essex-based Revolve Technologies, said Hayles. There are currently six hydrogen filling stations located across the UK but Mike Dolman, who is overseeing much of the infrastructure development in his role as Michael Dolman Principal Consultant Element Energy, told AM that there were currently applications for eight more in London and three in Aberdeen. Hayles said that last week’s record-breaking challenge, which saw drivers lap the M25 around the clock for 6,060 miles – beating the previous record of 6,024 – was “no great challenge” for Hyundai’s hydrogen-powered ix35, but admitted that it was a useful exercise. He said: “It does show people that the technology is viable and will do what everyone wants their vehicle to do on a daily basis…and more. He added: “People may still have reservations about hydrogen, but nobody ever questions the fact that they’ll drive around with 50 litres of petrol or diesel underneath them.